TP70 Valle Pewter Cloak Clasp. Sizes: 2.5" x 1.1". Solid hand cast jeweler's quality pewter imported from Norway. Suitable for medium to medium-heavy cloaks. 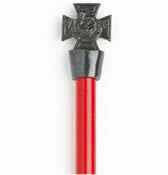 Great for Medieval, Renaissance, Gothic, Victorian, Edwardian, Colonial, Civil War or almost any period. Hand cast in Norway by the artist; this solid pewter jewelry is of the highest quality of level of detail. This is the quality of jewelry handed down for generations and cherished for its unique beauty. 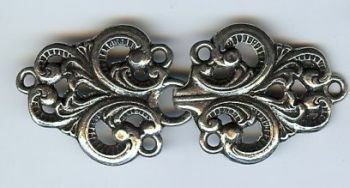 See our other fine brooches, earrings, necklaces and cloak clasp in hand cast pewter. The Runic inscriptions used on these pieces of jewelry stem from excavations at Bryggen in Bergen. The patterns and designs have been inspired by the ornamental style of the Viking era.